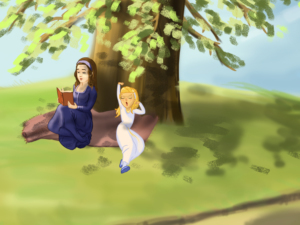 Alice was beginning to get very tired of sitting by her sister on the bank, and of having nothing to do: once or twice she had peeped into the book her sister was reading, but it had no pictures or conversations in it, 'and what is the use of a book,' thought Alice 'without pictures or conversation?' So she was considering in her own mind (as well as she could, for the hot day made her feel very sleepy and stupid), whether the pleasure of making a daisy-chain would be worth the trouble of getting up and picking the daisies, when suddenly a White Rabbit with pink eyes ran close by her. The Rabbit pulled a watch out of his pocket to check the time. He shook his head, then disappeared down a rabbit's hole. "I must find out why he's in such a hurry!" cried Alice. Filled with curiosity, she ran to the rabbit's hole and peeped through the entrance. 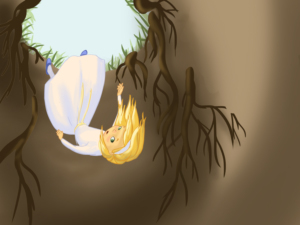 The hole dropped suddenly and Alice fell. She fell for a long time when suddenly she came upon a little three-legged table, all made of solid glass. There was nothing on it except a tiny golden key. When she looked around again, she came upon a low curtain she had not noticed before, and behind it was a little door about fifteen inches high. She tried the little golden key in the lock, and to her great delight it fitted! 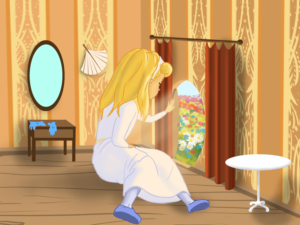 She opened the door and saw a beautiful garden through it, but she couldn’t reach it as she was too big. When she turned around towards the three legged table, Alice found a green bottle that said "DRINK ME" magically appeared on it. Out of curiosity, Alice took the bottle and drunk the entire potion. Then, she began to shrink until she was no bigger than a doll. She opened the door and quickly ran through it. "What a splendid garden!" she exclaimed. "Why, I'm no bigger than the insects that crawl on these flowers." But the excitement soon wore off. 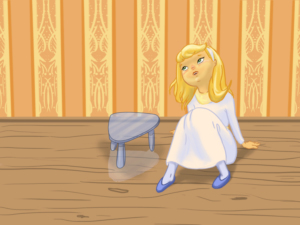 Alice grew bored with her tiny size. "I want to be big again," she shouted. 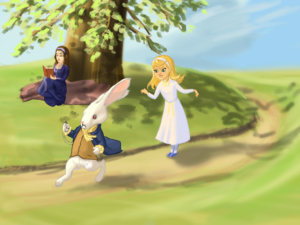 Her shouts startled the White Rabbit, who ran past her again. Mistaking her for his maid, he ordered, "Go to my cottage and fetch my gloves and fan." Alice was confused by the Rabbit's behavior. "Maybe I'll find something at the cottage to help me find my way out," she said hopefully. As she was going out she saw a piece of chocolate cake that was kept on a table by the doorway. Next to the cake was a note that read "EAT ME". "I'm so hungry," Alice said as she ate the cake. Suddenly she felt strange and realized - “Oh no! I've grown larger than this house!" she cried. "Get out of my way! You're blocking the door!" shouted the White Rabbit. Alice managed to pick up his fan. Immediately, she began to shrink. But little did she know, it was a magical fan, which made her small again. "Oh no, I'll never get back to the right size," She went looking for help. Soon, she saw a green caterpillar dressed in a pink jacket. 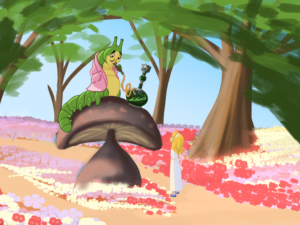 He was sitting on the top of a large mushroom, smoking a bubble pipe. 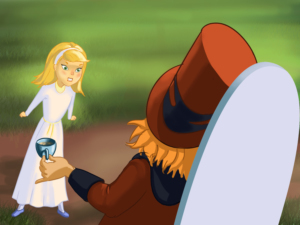 "One side makes you big, the other side makes you small," he said to Alice before slithering away. "One side of what?" Alice called after him. "The mushroom, silly," he answered. Alice ate a piece of the mushroom. "Thank goodness, I'm growing!" she cried, "But which way do I go?" "That path leads to the Mad Hatter. The other way leads to - Lae March Hare," said a voice. 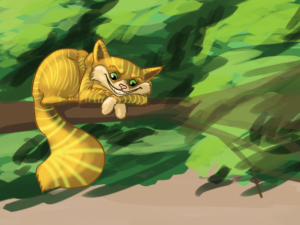 Alice turned to find a smiling Cheshire Cat in a tree. "I'll see you later at the Queen's croquet game," he said before disappearing. 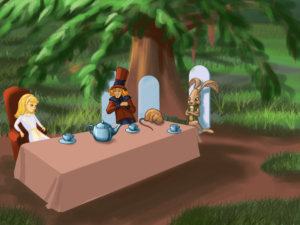 There was a table set out under a tree in front of the house, and the March Hare and the Hatter were having tea at it: a Dormouse was sitting between them, fast asleep, and the other two were using it as a cushion, resting their elbows on it, and talking over its head. 'Very uncomfortable for the Dormouse,' thought Alice; 'only, as it's asleep, I suppose it doesn't mind.' The table was a large one, but the three were all crowded together at one corner of it: 'No room! No room!' they cried out when they saw Alice coming. 'There's PLENTY of room!' said Alice indignantly, and she sat down in a large arm-chair at one end of the table. 'Have some wine,' the March Hare said in an encouraging tone. Alice looked all round the table, but there was nothing on it but tea. 'I don't see any wine,' she remarked. 'There isn't any,' said the March Hare. 'Then it wasn't very civil of you to offer it,' said Alice angrily. 'It wasn't very civil of you to sit down without being invited,' said the March Hare. 'I didn't know it was YOUR table,' said Alice; 'it's laid for a great many more than three.' "You may stay if you answer my riddle." shouted the Mad Hatter. "Why is a raven like a writing desk?" Alice felt dreadfully puzzled. The Hatter's riddle seemed to have no sort of meaning in it, and yet it was certainly English. 'I don't quite understand you,' she said, as politely as she could. 'Have you guessed the riddle yet?' the Hatter said. 'No, I give up,' Alice replied: 'what's the answer?' 'I haven't the slightest idea,' said the Hatter. 'Nor I,' said the March Hare. Alice sighed wearily. 'I think you might do something better with the time,' she said, 'than waste it in asking riddles that have no answers.' And she continued her walk. 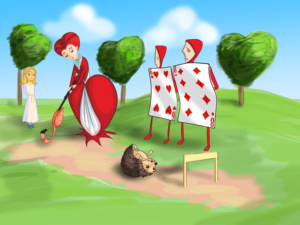 Suddenly she found herself in the middle of a field where the Queen of Hearts was playing croquet. Her guards and gardeners were shaped like cards. One gardener had planted white roses by mistake and then painted them red, "Off with their heads!" shrieked the Queen. "I hate white roses!". 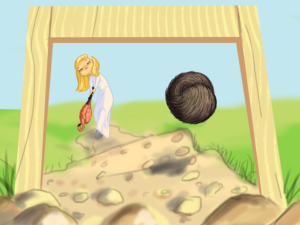 Then she noticed Alice and asked her "Have you ever played croquet?" "Yes," Alice timidly answered. "But I've never used a flamingo or a hedgehog." "Play with me!" ordered the Queen." And let me win or I'll have your head!" Alice tried her best to play well, but she had trouble with her flamingo. "Off with her head!" cried the Queen. Just then a trumpet sounded in the distance calling court to session. Everyone rushed into the courtroom. 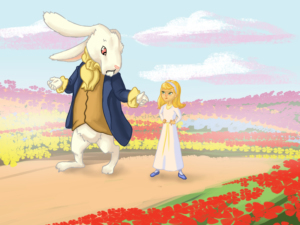 "Court is now in session," announced the White Rabbit, "Will Alice please come to the stand?" 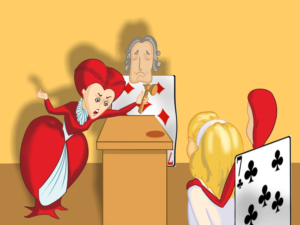 Alice took the stand and looked at the jury box, where the March Hare and the Mad Hatter were making noise. The Dormouse slept and the Cheshire Cat smiled at her. "What's going on?" asked Alice. "You are guilty of stealing the delicious heart-shaped tarts!" accused the Queen, "And now you must be punished. Off with her head Off with her head!" yelled the Queen. "How silly," replied Alice. "I did not have the slightest idea what you were talking about! I was only playing croquet." 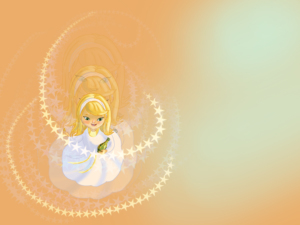 Alice felt someone touch her shoulder, "Wake up. 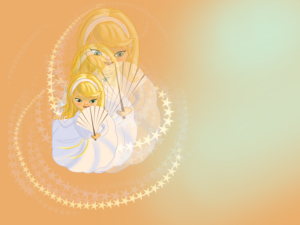 You've been sleeping for too long," said her sister softly. "I had a strange dream," said Alice. She told her sister about the White Rabbit, the mad tea party, the Queen of Hearts and the trial. But her sister wasn't paying attention. 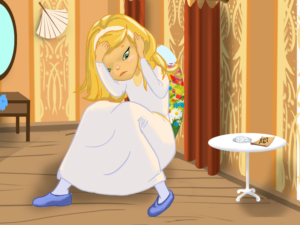 "You're reading again," mumbled Alice. As she stretched, Alice saw a little White Rabbit with pink eyes scurry behind a tree.